Why is your ear lobe swollen? How can you treat it? A swollen ear lobe causes discomfort that extends from crusting and itchiness to tenderness and pain. In this article, you’ll learn what causes ear lobes to swell, including infection, cauliflower ear, abscesses and piercings. We’ll also let you know the best way to treat the swelling in your ear lobes. Swollen ear lobes display tightness, enlargement and distention, due to reasons we will discuss below. This swelling may be on your whole ear lobe, or just on part of it, like the outer part, the underneath part or the area behind the ear lobe. Swelling of the ear lobe is sometimes accompanied by symptoms including rash, itchiness, flaking, crusting, warmth, tenderness or redness. Your lobes may feel lumpy or bumpy, especially if the swelling is caused by boils, abscesses, pimples or cysts. You may have swelling in the ear lobe because you have had an allergic reaction to face or hair care products, or earlobe piercing jewelry. If you wear cheap earrings, they may contain nickel, which can lead to itchy and swollen earlobes. You can prevent allergic reactions by only using jewelry made from silver, stainless steel or gold. Allergic reactions to your ear jewelry may be very painful, and can cause discharge and bleeding from your piercing hole. For treatment of swollen ear lobes caused by an allergic reaction, avoid any contact with possible allergens. Remove jewelry that causes a reaction and take an antihistamine if you have a serious reaction. Home remedies like ice packs or cold compresses can help, as well as OTC pain killers and anti-inflammatory medications. This is a fairly common cause of swollen ear lobes. Right after you have a piercing done, there is usually swelling, some pain and redness. It will only last for several days if you take care of the piercing properly. To relieve ear lobes that are swollen after piercing, use cold compresses and anti-inflammatory medicines. Speak with your physician if the swelling lasts longer than three or four days, so you’ll know if you’re developing an infection. Stretching an ear lobe piercing may cause temporary pain and swelling, especially if you went up a gauge or have an infected piercing. Either case can result in tenderness or pain in the ear lobe. You can tell if it is more than irritation from stretching. You’ll notice more swelling and redness, and possibly swollen lymph nodes or an abnormal discharge. If your infection is serious, contact your physician. Mild infection symptoms may be treated with normal care after a piercing. An infection of the ear, particularly after a piercing, can cause ear lobe swelling. This infection is often accompanied by swollen lymph nodes under the ear, pus or discharge, tenderness and pain. Use your piercing aftercare techniques or call your physician to get a prescription for an antibiotic. Insect bites from bedbugs or other types of bugs may cause your ear lobes to become swollen and possibly itchy. 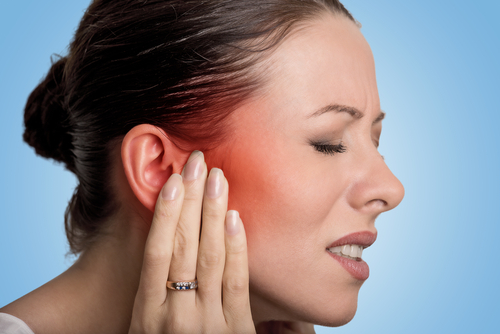 If you wake up with a swollen ear lobe and it was fine when you went to bed, this could be due to an insect bite. Some quick ways to relieve the pain of insect bites includes hydrocortisone cream and OTC antihistamines. If your swelling extends to the face, throat or neck, this may be a serious reaction. Contact your physician. Another cause of swollen ear lobe is cysts or boils. Cysts are sac-like or closed-capsule structures, usually filled with gaseous, semi-solid or liquid materials, much like blisters, according to medicalnewstoday.com. Cysts may occur anywhere on your body and often are found in the tissue. They may be caused by chronic inflammatory problems, blocked ducts, broken blood vessels, cell defects, parasites, tumors, genetic conditions or infection. They are treated by having them drained or surgically removed. Carbuncles and boils are painful, red lumps caused by localized skin infections. Often, they are caused by staph bacteria that can enter your skin through hair follicles or broken skin (cuts or abrasions). Abscesses commonly cause a swollen ear lobe. They are painful collections of pus that are usually brought about by bacterial infections, according to nhs.uk. They develop as your white blood cells attack some bacteria attempting to get into the body. Suspect that your problem is an abscess if you have a pus-filled, swollen lump beneath the surface of your skin, according to nhs.uk. Abscesses may drain on their own, then shrink and dry up. However, some will need to be drained, and you’ll sometimes need an antibiotic to completely clear up the infection. Cauliflower ear, also known as hematoma auris, is a deformity of your ear caused by a blunt trauma or other similar injury. These are the types of injuries often seen in wrestling or boxing matches, according to webmd.com. If you don’t treat this, it can result in the prevention of normal blood circulation in the ear. This leads to a bumpy or lumpy appearance, and possible permanent deformities on the ear lobes and ear cartilage. 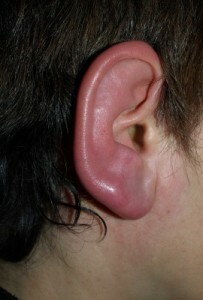 Cauliflower ear may result in a swollen ear lobe, formation of typical scar tissue and a deformed appearance. You’ll need early treatment if you want to avoid a blood clot that stops your proper blood circulation to the ear. If your lobe looks very red, white or purple, contact your doctor. Pimples can result in swelling behind your ear lobe, or on or below the lobe. Zits or pimples are formed when excess oil and dead skin are trapped in your pores, and they become infected by bacteria. A pimple can affect other parts of the body, too. They may become inflamed, and cause swelling, redness and tenderness. Treatments for pimples include antibacterial agents, salicylic acid or benzoyl peroxide. Serious cases could require prescriptions and possible antibiotics. Try some of the home remedies below, keep up on your hygiene and do not pop pimples. While we looked at the various causes of a swollen ear lobe, we advised you of ways each problem can be treated. Bacterial infections are treated with oral or topical antibiotics. Allergies and bug bites are generally managed with antihistamines. Deep pimples and cysts are treated by draining or removing through surgery. For relief from the tenderness, pain and warmth that accompany most swelling in the ear lobe, you can use OTC painkillers, cold compresses, ice packs or anti-inflammatory medicines. If you have swollen ear lobes for more than a few days, if you are experiencing a serious allergic reaction or you have yellow or greenish discharge after a piercing, you should consult your doctor.